I'm very excited that Teri is joining us today to discuss how she finds her writing groove! I love learning about Author's quirky and non-quirky habits they've picked up while getting into their zone. Thank you, Teri, for stopping by today!!! 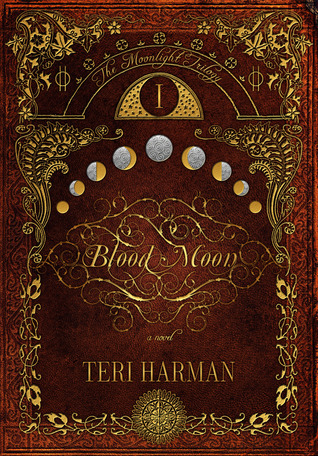 Before I give Teri the floor, let me tell you a little bit more about Teri and her novel Blood Moon! 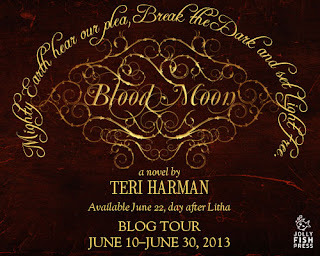 It's an honor to be a part of the Blood Moon Blog Tour! Click on the Tour Banner above to see the other stops on the tour! Now, I'm going to give Teri the floor!!! Thank you again, Teri, for stopping by Kayla's Place Today! Getting in the best groove for writing is often like trying to find the most comfortable sleeping position: sometimes it happens automatically and other times you toss and turn. Because I have three children under seven and my husband travels nearly every week, I don’t currently have the luxury of being picky about how and when I write. I’ve trained myself to write in the chaos of everyday life. If I waited until it was quite and I was alone, it would take me ten years to write one book. However, there are a few things I like to do that help me get in the groove. 1 – Comfy clothes. I basically live in jammie pants and old T-shirts. My favorite outfit is a pair of PJ pants with an owl pattern and a twelve year old T-shirt my husband picked up in Spain. It’s red and has a hideous big bull on it, but it’s very comfortable. 2 – Music or a fan. I often write with music that blocks out other noises, sets the tone of the scene I want to write, but doesn’t distract. If I’m doing a lot of rereading for editing purposes, I prefer to turn on a small fan instead of music. It cuts down on ambient noises, but isn’t as distracting as lyrics I tend to sing along with. 3 – Where I write? I have two favorite places to write: my own desk which is in our bedroom and my mom’s house. I’ve tried the coffee shop thing, the library, even sitting in quiet hospital waiting rooms, but it’s just not comfortable enough for me. I like to be somewhere familiar where I can wear my jammies, grab snacks and walk around in my slippers. As far as HOW I actually write a novel. Here are a few things that work for me. 1 – Inspiration is everywhere. It all starts with an idea that sticks in my head. It might be a situation, a character, a place or even just a single image. BLOOD MOON and the Moonlight Trilogy were inspired by a Halloween party I threw in 2010 at a creepy old school house. I read a lot about witches to get ideas for décor, games and activities. After the epic party, I realized I had enough research to base a novel on. 2 – Organized chaos. I’m mostly a “no outline” writer. I write very instinctively. I have to sit down and get involved with the characters and the setting to generate ideas. Sometimes this is wonderful, other times frustrating. 3 – Crazy person wall. I keep a lot of notes and ideas in a binder and in Evernote on my phone. Oh, and post-its. If there is ever a post-it note shortage it’s my fault. I also mark down each scene I write on a big index card that then goes up on a wall. In my family this is known as my “crazy person wall.” It may not be chic décor and slightly reminiscent of a serial killer’s house, but it works. It’s like a living outline and a timeline that I can play with and adjust. 4 – Editing and more editing. I try to do 2-3 drafts/rewrites of my books. I write my first draft in Scrivener, a program made for writers. This program keeps every scene and chapter separated in folders, which is very handy for editing. My second draft I transfer into Word by copy/paste and rewriting because my publisher needs the final product as a .doc. Then I print that draft out on paper and sit down with my trusty red pen. Lastly, I go through and do a clean-up edit. Then off to my editor it goes. Once he gets it there are at least two more rounds of edits. It’s a LOT of editing, but that is how something good becomes great. I’m still learning the techniques and devices that help me best write a book; it’s an ever evolving process. Writing a trilogy is very different from writing a stand-alone novel. My best advice to new writers is to experiment and to read lots of books on the craft of writing. Gather ideas and techniques and then go for it. Use the Rafflecopter below to enter for your chance to win a $25 Amazon Giftcard!